An entertaining and fanciful comedy, and one of our most successful plays of all time! Mrs. Savage has been left ten million dollars by her husband and wants to make the best use of it, in spite of her grown-up stepchildren’s efforts to get their hands on it. Knowing that the widow’s wealth is now in negotiable securities, and seeing they cannot get hold of the fortune, the stepchildren commit her to a sanatorium hoping to “bring her to her senses.” In the sanatorium Mrs. Savage meets various social misfits, men and women who just cannot adjust themselves to life, people who need the help Mrs. Savage can provide. One of the bard's greatest tragedies. A brave Scottish general named Macbeth receives a prophecy from a trio of witches that one day he will become King of Scotland. Consumed by ambition and spurred to action by his wife, Macbeth murders King Duncan and takes the Scottish throne for himself. He is then wracked with guilt and paranoia. Forced to commit more and more murders to protect himself from enmity and suspicion, he soon becomes a tyrannical ruler. The bloodbath and consequent civil war swiftly take Macbeth and Lady Macbeth into the realms of madness and death. Theatre Showcase is quickly growing to be one of the most exciting evenings of theatre in the Texas Hill Country. The night includes two, fully produced, one-act plays from Theatre Production classes, and kick off with debut monologues and duet scenes from Theatre I students. For most of them it's their first time to ever take the stage. Theatre Showcase is their stepping stone to greater productions in their future. Show titles TBD. 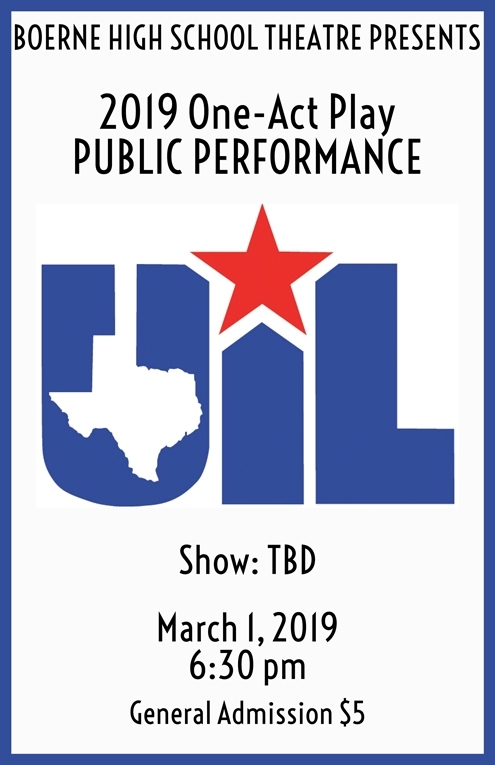 Each year, BHS Theatre competes in the largest play production contest in the world, UIL One-Act Play. More than 14,000 Texas high school students in more than 1,000 plays participate in 300 plus contests, which take place from the beginning of March through the three-day, 40-production State Meet One-Act Play Contest. The One-Act Play Contest is supported by more than 200 college and university faculty members serving as critic judges. The League's theatre program is considered by historians to be the foundation of educational and community theatre in Texas. It continues to be a major factor motivating increasing numbers of schools to offer theatre arts as an academic subject. Join us for our a variety show of sorts with scenes/selections from a number of Broadway Musicals, brought to you by the students of the Musical Theatre class. This will be our second year with our Musical Theatre class, co-taught by Boerne Choir Director, Ms. Nancy West and Mr. Aviles.